May the Archangel's intercession and blessings be with us all and Glory be to our God forever. Amen. On this day we commemorate the entrance of our holy Lady, the Virgin, Saint Mary, the Theotokos, into the Temple when she was three years old, for she was dedicated to God. Her mother, Anna (Hannah), was childless. The women who were in the Temple stayed away from her. She was exceedingly sad and so was her husband Joachim who was a blessed old man. She prayed to God fervently and with a contrite heart saying, "If You give me a fruit, I will devote the child to Your Holy Temple." God answered her prayers and she brought forth this pure saint and called her Mary. She reared her for three years, after which she took her to live with the virgins in the Temple. Saint Mary dwelt in the sanctuary for 12 years. She received her food from the hands of the angels, until the time when our Lord Christ came into the world, and was incarnated through her, the elect of all women. When she had completed 12 years in the sanctuary, the priests took counsel together concerning her, so that they might entrust her to someone who would protect her, for she was consecrated to God and they were not allowed to keep her in the temple after this age. They decided that she be engaged to a man who could take care of her and who would look after her. They gathered 12 righteous men from the house of David of the Tribe of Juda so they might place her with one of them. They took their staffs inside the Sanctuary, and a dove flew up and stood on the staff belonging to Joseph the carpenter who was a righteous man. They knew that this was God's will. 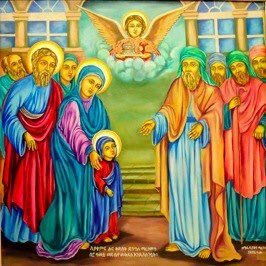 Joseph took the holy Virgin St. Mary, and she dwelt with him until Gabriel, the Angel of the Lord, came to her and announced to her that the Son of God was to be incarnated from her, for the salvation of Adam and his posterity. Her intercession be with us and Glory be to our God forever. Amen. This is a feast colorfully celebrated every year on Hidar 21 (November 30) at every church dedicated to St. Mary. The day is observed with special fervor particularly in Axum Tsion where the ArK of the Covenant is housed safely. 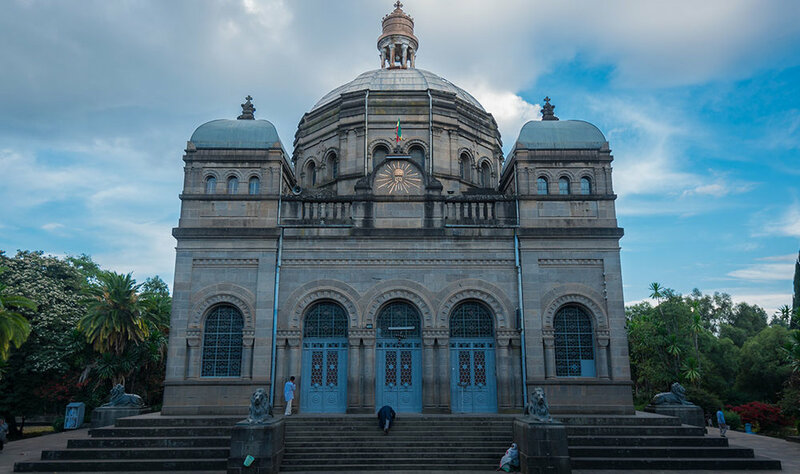 The occasion is attended by massive Christian pilgrimages from all over Ethiopia and also foreign visitors making it one of the most joyous annual pilgrimages in Axum, the sacred city of Ethiopians. The Church of Our Lady Mary of Zion claims to contain the original Ark of the Covenant.The Feast of the Ark of the Covenant (locally known as Tabote Tsion) is held in commemoration of different historical events including the coming of the Ark of the Covenant to Ethiopia and the construction of the first church dedicated to St. Mary in Axum. The Ark of the Covenant described as the original container for the Ten Commandments and the central symbol of God’s presence with the people of Israel. Its names convey the holy sense of God’s presence. The Hebrew word for ark means simply “box, chest, coffin,” as is indicated by its use for the coffin of Joseph (Genesis 50:26) and for the Temple collection box of King Joash (2 Kings 12:9-10). The word “covenant” in the name defines the ark from its original purpose as a container for the stone tablets upon which the Ten Commandments (sometimes called the “testimony”) were inscribed. Sometimes it is identified with many names but most ornately known by “the Ark of the covenant of the Lord of hosts Who is enthroned on the cherubim” (1 Samuel 4:4). After the exodus of the Israelites from Egypt, God gave them the tablet of the Ten Commandments (Tabote Tsion) through Mosses in the mount of Sanai so they use it as a sacred instrument to worship God. The Ark was carried by the Israelites during their 40 years of journey to the land of hope. Whenever they camped, the Ark was placed in a special and sacred tent called the Tabernacle. In the course of time, during the reign of Elli, unusual events took place among Palestinians and Israelites. The story recounted in the 1st Book of Samuel goes as follows. The old priest Eli had two children (Hophni and Phinehas) who were behaving wickedly, taking for themselves all the prime cuts of meat from sacrifices and committing adultery with women who served at the sanctuary`s entrance. Eli was aware of their behavior but he rebuked them too lightly and was unable to make them give up their bad deeds. He used to tell them, “my children what I heard of you is wrong; if a man does wrong to a man to God is prayed for, but how could you do wrong to God?” but he refrained from punishing them because they were his sons. Israelites were always victorious in their battles whenever they had Tabote Tsion amidst them. But because God’s wrath was on them due to the sins of Eli’s sons, they lost the battle and many thousands died in the war filled. Tabote Tsion was captured in the battle and both of Eli’s sons were killed. Eli, who was nearly blind, was unaware of the event until he asked about all the commotion. Sitting in a chair, he was told what had happened by a soldier who had fled the battle. The soldier said to Eli "I am one who has barely escaped from the war to tell you that the ark has been captured by our enemies and both of your sons died on the war"
Upon hearing the shocking news, Eli fell backwards out of his chair and died from a broken neck. He was a Judge of Israel for a total of 40 years, and died at the age of 98. His daughter-in-law, the wife of Phinehas, was pregnant and near the time of delivery. When she heard the news that the Ark of God had been captured and that her father-in-law and husband were dead. She went into labor and gave birth, but was overcome by labor pains. As she was dying, the women attending to her said "Don’t despair; you have given birth to a son." But she did not respond or pay any attention. She named the boy Ichabod, to mean The Glory has departed from Israel – because of the capture of the Ark of God and the deaths of her father-in-law and her husband. After their victory at Ebenezer, the Philistines took Tabote Tsion to their country but misfortune fell on them. When in Ashdom, it was placed in the temple of Dagon under the idol. The next morning Dagon was found prostrate, bowing down before Tabote Tsion. They again restored the idol to its original place but yet again on the following morning Dagon was found broken into pieces. The Philistines were also plagued by diseases and an outbreak of mice. They then sent Tabote Tsion to the land of Ashdon. But the same tragedy occurred among the people of Gath and Ekron to whom Tabote Tsion was moved. After the Ark had been among them for seven months, the Philistines, on the advice of their diviners, returned it to the Israelites, accompanying its return with an offering consisting of golden images of the tumors and mice with which they had been afflicted. The Ark was then set in the field of Joshua (1 Sam. 6:1-15). 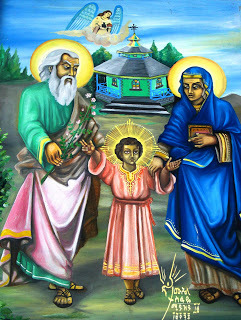 Based on these miraculous events, the Ethiopian Church celebrates the feast of the Ark of the Covenant locally known as Tabote Tsion. May the intercession and blessings of Saint Mary be up on us all! Holman Bible Dictionary, published by Broadman & Holman, 1991. "Sacred Sites of Ethiopia and the Arc of the Covenant". Sacredsites.com. Retrieved 2016-11-27. On this day the church celebrates the feast of the honored Archangel, Michael, the head of the hosts of heaven, who stands at all times before the great throne of God, interceding on behalf of the human race. An example of one of his wonders: A God-fearing man whose name was Dorotheus and his wife Theopista, held a festival of commemoration for the honored angel Michael on the twelfth day of each month. It happened that this righteous family fell on hard times and had nothing to celebrate with for the commemoration of the honored Michael. They took their clothes to sell so that they might have a feast. Michael the Archangel appeared to Dorotheus and commanded him not to sell his clothes, but to go to a sheep-master and to take from him a sheep worth one-third of a dinar. He was also to go to a fisherman and to take from him a fish worth one-third of a dinar but Dorotheus was not to slit open the fish until he came back to him. Finally, he was to go to a flour merchant and to take from him as much flour as he needed. After they had finished the celebration and all the people had departed, the Archangel appeared to Dorotheus as before and commanded him to cut open the belly of the fish. He found 300 dinars of gold and three coins each is a third of a dinar. He told him these three coins were for the sheep, the fish and the flour, and the 300 dinars were for him and his children. God had remembered them and their oblations and had rewarded them here, in this world and in the kingdom of heaven on the last day. As Dorotheus and his wife were astonished at this matter, the Archangel Michael said to them, "I am Michael the Archangel who delivered you from all your tribulations and I have taken your oblations and alms up to God, you shall lack no good thing whatsoever in this world." They prostrated themselves before him and he disappeared and went up into heaven. This was one of the innumerable miracles of this honored Angel. Salutation to thee, O merciful angel Michael whom I have feared from my youth up; hide me under thy prayers at dawn and at eve. On this day, the church celebrates the commemoration of the transfiguration of our Lord and Savior Jesus Christ on Mount Tabor. The disciples, Peter, James and John, were with Him, and about whom the Lord said, " .... there are some standing here who shall not taste death till they see the Son of Man coming in His Kingdom." (Mt. 16:28) He fulfilled His promise, for six days later, He took His three disciples, up on a high mountain, where He was transfigured before them. His face shone like the sun, and His clothes became as white as light. And behold, Moses and Elijah appeared to them talking to the Lord. The Lord wants to teach us that He is the Lord of Moses whom He can raise from the dead, and that He is the God of Elijah whom He can bring back from heaven. St. Peter said to Jesus, "Lord, it is good for us to be here, if you wish, let us make here three tabernacles: one for you, one for Moses and one for Elijah." This indicated the weakness of Peter for he thought that the Lord needed something to cover Him from the sun. It also indicated his good character, for he did not think of himself or the other disciples. We should not marvel at the lack of knowledge of the disciples, for they were not yet perfected. While Peter was still speaking, behold a bright cloud overshadowed them, so that Peter would know that Jesus was not in need of tabernacles made by hands. Suddenly a voice came out of the cloud saying, "This is My beloved Son, with Whom I am well pleased; listen to Him." (Mt. 17:1-8) When the disciples heard the voice, they fell on their faces and were exceedingly afraid. Jesus came and touched them with His blessed hand, saying, "Rise, and have no fear." And when they lifted up their eyes, they saw no one but the Lord Jesus alone. To Him is the Glory forever. Amen. On August 7th, the church celebrates the beginning of St. Mary’s Fast. The fast is 15 days long and precedes the Feast of the Assumption of the Holy Theotokos St. Mary on August 22nd. St. Mary carried a name that has long been remembered as the Joy of Generations. It is through her enduring example of obedient faith, strong will, and spiritual purity that we come to understand why she is rejoiced of Angels. Here is a brief glimpse on St. Mary’s heavenly nature. The very first promise concerning the Redeemer, after falling of Adam and Eve, contained a prophecy about a special Woman. God said to the devil: “I shall put enmity between thee and the Woman, and between thy seed and Her Seed” (Genesis 3:15). The prophet Isaiah added important details to this first prophecy of Genesis. He said that the Woman, Who will give birth to the Messiah-Emmanuel, will be a virgin. “God Himself shall give you a sign,” explained the prophet Isaiah to the disbelieving descendants of King David, — “the Virgin shall accept into her womb and bear a Son, and shall name Him Emmanuel, which means: God is with us” (Isaiah 7:14). On this day, God sent angel Gabriel to announce to Joachim the birth of the Virgin Mary, the mother of the incarnated God. Joachim and his wife Anna (Hannah) had no children. Joachim was a direct descendant of King David but lived a very modest and simple life. Gabriel announced to him that his wife Anna would conceive and bear a child, that would delight his eyes and please his heart, and all the world would rejoice and be glad. On this day the church celebrates the birth of the pure Virgin St. Mary, the Mother of God (Theotokos), through whom Salvation came to mankind. She was born in the city of Nazareth in Galilee, where her parents lived. On this day, Our Lady, the all pure, Virgin St. Mary, the Mother of God, departed. As the Holy Virgin prayed on the Mount of Olives (near Jerusalem), the Angel Gabriel appeared to her, and announced to her that in three days her earthly life would come to an end and that the Lord would take to Him. The Lord arranged it so that toward that time the Apostles congregated in Jerusalem from the many parts of the world where they were preaching. At the hour of her end, a bright light illuminated the room in which the Virgin Mary was lying. The Lord Jesus Christ Himself, surrounded by Angels, appeared and received her most pure soul. The Apostles buried her holy body, according to her wish, at the foot of the Mount of Olives in the Garden of Gethsemane, in the cave where reposed the bodies of her parents and of the righteous Joseph. On this day, was the assumption of the body of our pure Lady St. Mary, the Mother of God. After the virgin St. Mary gave up her pure spirit, the Apostles shrouded her pure body and carried it to Gethsemane. Some of the Jews blocked their way to prevent them from burying the body. One of the Jews seized the coffin with his hands, which were separated instantly from his body and they remained attached to the coffin. He regretted his evil deed and wept bitterly. Through the supplications of the saintly apostles, his hands were reattached to his body, and he believed in the Lord Christ. When they placed the body in the tomb, the Lord hid it from them. St. Thomas the Apostle was not present at the time of St. Mary’s departure. Three days after the burial of the Theotokos, there arrived belatedly the Apostle Thomas. He wished to see her body for the last time, a cloud carried him to Jerusalem. On his way, he saw the pure body of St. Mary carried by the angels and ascended to heaven with it. One of the angels told him, “Make haste and kiss the pure body of St. Mary,” and he did. The years of her life on earth were 60 years. She was 12 years old when she left the temple. She spent 34 years in Joseph’s house, until the Ascension of the Lord, and 14 years with St. John the Evangelist, according to the commandment of the Lord which he told her at the cross. On this day, the church celebrates the commemoration of the angel Michael, the Archangel, the intercessor of the human race. The one who appeared to Joshua the son of Nun, encouraged him, and told him, "Nay, but as captain of the hosts of the Lord am I now come." He made the city of Jericho to fall into his hands, and he stopped the sun for him. On this day, the church commemorates the pure and Virgin St. Mary, the mother of the Savior of the world, the intercessor of all the Christians, from whom came the salvation of Adam and his posterity. EASTER CELEBRATION APRIL 15 tO April 16, 2017 FROM 6:00 PM TO 1:30 AM. At this time the congregation shall light the candles and chant after the deacons. 1:30 a.m. Closing prayer and dismissal. On this day also, the Lord Christ entered the Temple, driving away the merchants and overturning the tables of the money-changers. This was clearly a sign of His anger towards using religion as a means of trade. He also overturned the seats of those who sold doves, casting them out of the Temple. Again, this was also a clear sign of His disapproval towards selling and devaluing the gifts of the Holy Spirit, since the doves symbolize the gifts of the Holy Spirit. As for the Lord’s anger and the whip of cords He used, they foretold of the severity of how Satan and his followers who refused Christ as Lord and God would be judged o­n Judgment Day.